Social media has played a huge role in forcing brands to be more open, honest and communicative about their business practices -- especially important for millennials, who have been raised with expectations for instant gratification and social responsibility, according to research. Sprout Social’s latest report shows business leaders and politicians can no longer hide behind press releases and press conferences. Social media is the No.1 communication channel of choice for transparency as ranked by millennials. More than one in five millennials (22%) say a CEO’s transparency on social would encourage them to consider a career with that employer in the future. Thirty-six percent of consumers attribute the increasing value of transparency to social making it easier to monitor a company's practices. Just 15% of people believe brands are already very transparent on social media. 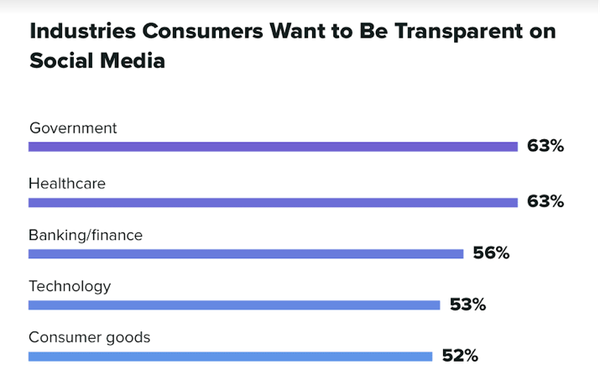 Twice as many consumers (30%) say brands aren’t transparent at all on social, according to the report. Consumers single out brands as the group with the greatest responsibility to be transparent on social media, rating brands higher than friends, family and politicians. While only 71% of individuals hold themselves to a standard of transparency on social, 81% expect the same from brands. The following practices demonstrate a lack of transparency on a brand's social media sites: withholding information (picked by 69% of respondents); ignoring customer questions (68%); ignoring employee questions (58%); avoiding relevant political/social issues (34%); and not posting very often (20%). The majority of consumers (70%) want CEOs to have a personal presence on social media, citing they are better company representatives when they have their own social profiles. There are nine key ways brands can demonstrate transparency, including admitting to mistakes (61%), responding honestly to customers (58%) and discussing product/service pricing (45%).